Time and time again, artists from different backgrounds have found ways to connect and transcend cultural differences through music. 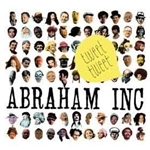 This is clearly the case in the unique collaboration of Abraham Inc's Tweet Tweet , the first release from a touring band that blends Klezmer music, funk, hip hop and jazz into an infectious and eclectic stew. Abraham Inc's groove trinity was created in 2005 by clarinet virtuoso David Krakauer, who enlisted Canadian rapper/beat-master/multi-instrumentalist Josh Dolgin (aka Socalled), and the grandmaster of funk, trombonist Fred Wesley, who's been the back-'bone in the bands of James Brown, Bootsy Collins, and Parliament Funkadelic. Toss in some additional horns from Krakauer's Klezmer Madness ensemble, Bronx rapper C Rayz Walz, and other talented musicians like guitarist Sheryl Bailey, and the party's already started. The music is organic, extracting the diversity of styles into a unique whole that is authentic and renewed. Krakauer's clarinet trills passionately articulates the music of his Eastern European Jewish heritage, which in turn is perfectly juxtaposed with Wesley and the band's funky James Brown-like horn vamps. The pocket is deep and Thick, provided by tight rhythms, be they straight hip hop beats in the title track or fervent Yiddish dance grooves in "Moskowitz Remix." Whether it's "The H Song"a revised remake of the Hebrew folk song "Hava Nagila"or "Trombonic," which combines Wesley's rotund soulful horn, clever rap lyrics and Bailey's blistering guitar run, the music represents holistic funk music of the first order. From the cool vibrations in "Push," with its equally smooth vocals and solos, to the show-stopping finale, "Abe Inc Techno Mix"with its earth-quaking full- throttled dub-beat mixingit's easy to understand why Abraham Inc is thrilling audiences from Europe's Transmusicales de Rennes to Harlem's Historic Apollo Theater. Track Listing: Tweet-Tweet; Moskowitz Remix; It's Not The Same (Figure It Out); The H Tune; Trombonic; Push; Baleboste: A Beautiful Picture; Fred The Tzadik; Abe Inc Techno Mix. Personnel: David Krakauer: clarinet; Socalled: sampler, piano organ, and vocals; Fred Wesley: trombone; Sheryl Bailey:guitar; C Rayz Walz: rap, vocals; Katie Moore: vocals; Matthew Flowers: vocals; Joshie Armstead: vocals; Alicia Krakauer: vocals; Allen Watsky: guitar; vocals; Jerome Harris: bass; Micheal Sarin: drums; Freddie Hendrix: trumpet; Brandon Wright: tenor saxophone; Will Holshauser: accordion (2); Jordan Dare: techno remix.